Wayback Machine is the one of the most interesting websites on the Internet. It used my millions of people to check how a website looked in the past. It keeps snapshot of websites over the time. So, you can go back in time to check the look of a website in past. In simple words Wayback Machine is the digital archive of the World Wide Web. It is operated by nonprofit organization, based in San Francisco, California, United States. The website was launched back in October 2001, it it started keeping archive much before the launch. I am sure you will try to see how Amazon.com looked when it was launched or the initial look of Twitter and Facebook. Yes, you can go ahead and try. For Amazon.com, I found the record as old as December 12, 1998. So, you know how old data you can check on Wayback Machine. But Wayback Machine is not the only website offering the past looks of a website. There are some good Wayback Machine alternatives that also let you see how a website looked in past. Wayback machine is currently blocked in China and was blocked in its entirety in Russia in 2015. And your country may also block it someday for some reason. So, it is a good thing to know its alternatives. I also want to make it clear that alternates of Wayback Machine are rare. So, I am just listing two alternates. 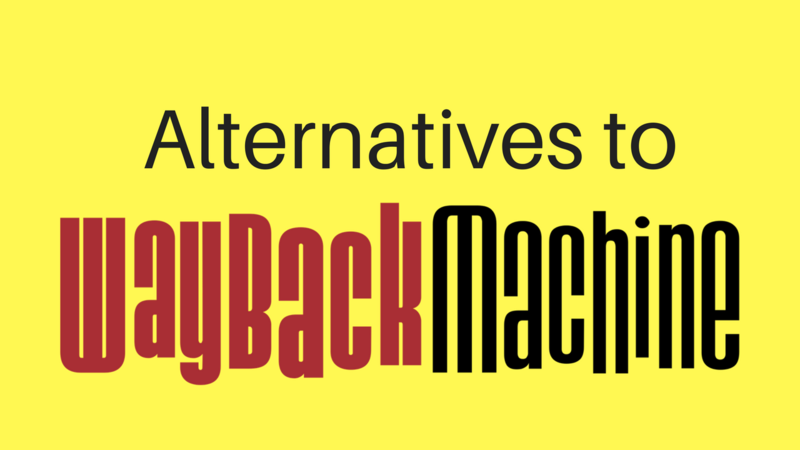 Many people have prepared a long list of Wayback Machine alternates with 5-10 alternatives. They just listed websites that captures screenshot or shows information about a domain. I am not sure how people can see Alexa as alternate of Wayback machine while Alexa is just a tool to check traffic related information. Few people even added WHOIS, Page Freezer and Competitor Screenshots. These websites are no where related to WayBack Machine. Few people added tools that starts making archive of a website on request. That is also not related to Wayback machine. So, I recommend you to avoid those articles and focus on what you are actually looking for. Wayback machine is a website that automatically makes the copy of all the websites of Internet. The frequency depends on the authority of the website. In this article, I am listing those websites that automatically make archive of Internet websites and you can look for look of a website in past. Here are the best Wayback machine alternates. Even if these alternates are not as good as Wayback machine, it is a good idea to know about these alternatives. Even if you are not using any of these, you still have name in your knowledge to tell other people about these alternatives. Screenshots is a an alternative to Wayback Machine for checking how a website actually looked in past. Just like Wayback Machine, It captures websites screenshot over the time and make a record to check. It just captures screenshots and does not keep copy of webpage. You just need to visit a website and enter the URL. It will show you the current screenshot of the website with a gallery of thumbnails to go and check the records of past. In the screenshot, you can see the first row with small thumbnails. For past records. This website is still much behind that Wayback Machine. As per the records available, Screenshots has been able to capture over 250 millions snapshots while the Wayback Machine has already collected over 350 billion pages. I also checked the previous snapshot of UseThisTip but could only find very few. It seems they capture screenshots less frequently, so the time gap between two consecutive screenshots is much higher. This website just keeps screenshots while the wayback machine saves the whole page. So, you can get much information at wayback machine that this. But you can easily have an idea of look and feel of a website in past with screenshot. Archive.is is another alternative to Wayback machine. Just like Wayback Machine, it keeps both screenshot and web page. The look and feel of this website is very ordinary. You just need to visit the website and enter the URL that you want to check back in history. This website is also not as good as Wayback machine. When I searched for my websites, it was showing 4 years of screenshots. So, it is very hard to get copies of website from a desired time frame. It keeps frequent copies of popular websites. If you are looking for websites with good reputation, you will not be disappointed. I could only find these websites that are similar to WayBack machine and can be seen as alternatives to WayBack machine. But trust me, there is no one in this list that is as good as WayBack machine. WayBack machine frequenly captures screenshots of a website and keeps a copy of HTML page. If you check any web page, you will see many copies of the web page in a single year. These two websites also focus on popular websites more than the less popular websites. While the same is done by Wayback machine, but that still has much higher frequency of capturing a web page. With the alternates, you are less likely get results of a desired time frame. For example, I wanted to see how UseThisTip looked last year and I could find the snapshot of 2014. The same case was with my website Techlomedia. So, there is nothing as good as WayBack machine. But I made this list just for the knowledge. I hope the article was useful and you find it interesting. DO not forget to follow UseThisTip on Twitter. We made the Twitter account of UseThisTip bit late. But that is a good thing to get all the latest updates we make. Now I am regular and try to publish interesting articles. If you also want me to write about anything specific. You can either use contact page or comment section to request.